The recipe for this Ukrainian stuffed cabbage or holubets (holubtsi is plural) is from Kramarczuk's Family Classics by Orest & Katie Kramarczuk (Beavers Pond Press, 2013). The book pays tribute to Wasyl and Anna Kramarczuk who emigrated from Ukraine and who started the Kramarczuk deli, sausage company, bakery and restaurant in Minneapolis in 1954 where it still stands today. Their son (Orest) and granddaughter (Katie) have compiled iconic, simple-to-prepare recipes from the business like this one. The authors say, "Holubets [is] a staple in Ukrainian cuisine. Don't let the cabbage intimidate -- they are always a crowd pleaser. The choice of a buckwheat filling makes them a wonderful and vegetarian option." The cabbage rolls can be served with an optional tomato cream sauce (recipe below) as it is at the restaurant. Remove core from each cabbage with a small paring knife. Place cabbages into a large pot of salted water, making sure they are fully submerged. Add vinegar. Boil cabbage about 30 minutes or until leaves fall freely from heads with a simple poke of a fork. Remove cabbage and allow it to cool. Carefully peel off each leaf one by one. Set aside and allow leaves to dry. Heat oven to 350 F degrees. Flip cabbage leaves so the stems face up. Shave some of the stems from the cabbage leaves with a small knife so they are easier to roll. Stack two leaves together, one on top of the other, so that the stems align. Add the desired filling (see recipes below) and gently roll. Once a shape is formed, push on both sides. 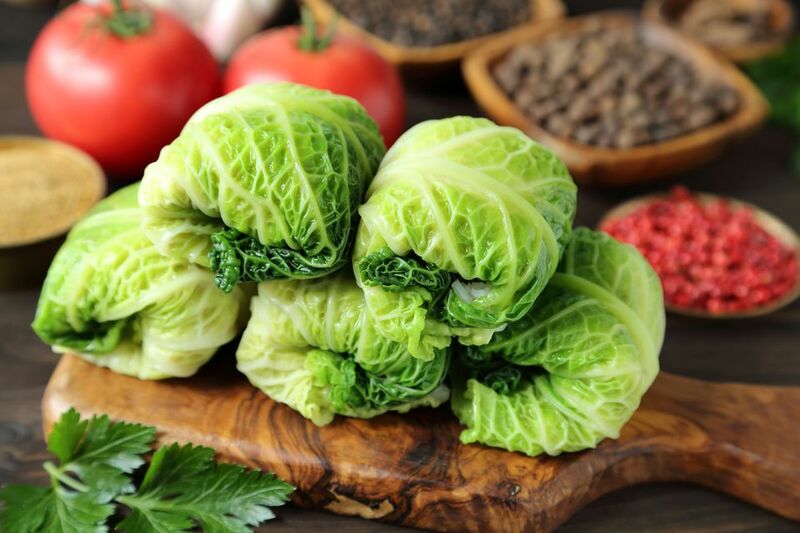 Line a deep roasting pan with excess cabbage leaves and place rolls side by side. Once the dish is full, place butter slices and spoonfuls of tomato sauce in between rolls. Pour stock of choice over rolls until submerged. Cover rolls with more leaves or aluminum foil. Bake 40 minutes or until boiling. Reduce heat to 300 F degrees and bake 1 hour. Serve with tomato cream sauce (see recipe below), if desired. Fry onion in butter and add pork. Cook until pork is slightly browned. Allow mixture to cool and season with salt and pepper. Mix buckwheat with egg and 5 tablespoons melted butter and spread on a sheet pan. Bake 30 minutes until browned, stirring the mixture every 10 minutes. Meanwhile, fry onion in 2 tablespoons butter. Remove sheet pan from oven and add potato and fried onion. Return to oven for an additional 10 minutes. Remove and allow to cool. Season with salt and pepper. Fry onion in 1 tablespoon butter in small saucepan over medium heat until tender. In a separate large pot, melt 3 tablespoons butter over medium heat and add flour. Cook about 21 minutes. Add onion, salt, sugar, and pepper, mixing constantly. Gradually add tomato sauce and chicken stock and bring sauce to a boil. Once boiling, add cream. Season further with salt and pepper, if desired. Optional: Fry 2 cloves of garlic with the butter and onion to create a delicious garlic sauce.